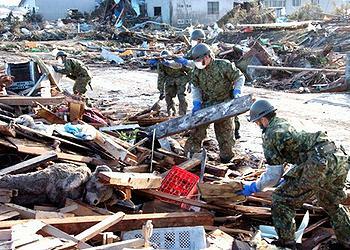 TOKYO, Japan, March 18, 2011 (ENS) – The death toll from the 9.0 magnitude earthquake and tsunami that struck northeastern Japan on March 11 exceeded 6,900 on Friday, the highest figure for a natural disaster in Japan since World War II, the National Police Agency said. While rescue teams are still pulling a few people alive from the wreckage, and aid workers struggle to cope with some 300,000 people displaced by the disaster, there was some encouraging news from the World Health Organization Friday. Radiation levels outside the 20 kilometer evacuation zone around the damaged Fukushima Daiichi nuclear power plant are not harmful for human health, the WHO said. WHO spokesperson Gregory Hartl made the remarks at a regular news conference in Geneva. He said the amount of radiation being reported outside of the evacuation zone continues to be below the levels considered a public health risk. Some countries are encouraging their citizens to leave Japan or are moving their embassies from Tokyo to Osaka, but Hartl said WHO finds no public health reason to recommend that foreign nationals leave the country or avoid travel to Japan, except to the affected areas. Japanese food imports are being examined for radioactive contamination by some countries, but Hartl said he cannot imagine that any food from the quake-damaged areas could have been delivered. He assured the public that there is no risk that exported Japanese foods have been contaminated with radiation. Graham Andrew, special adviser to the International Atomic Energy Agency director general on scientific and technical affairs, said at a separate briefing in Geneva that regular dose rate information is now being received from 47 Japanese cities. “First measurements in Tokyo by the Agency’s newly arrived radiation monitoring team today showed no indication of Iodine-131 or Caesium-137,” he said. 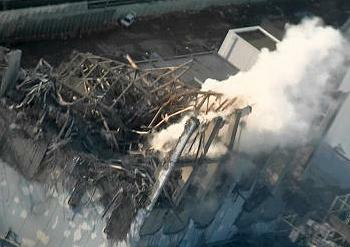 The situation at Fukushima Daiichi “remains very serious, but there has been no significant worsening,” said Andrew. IAEA Director General Yukiya Amano is in Tokyo today, where he met with Prime Minister Natao Kan and other senior government ministers as well as the vice-president of Tokyo Electric, which operates the Fukushima Daiichi nuclear power plant. The current situation at the reactors at Units 1, 2 and 3 appears to remain fairly stable, Andrew said. Seawater was injected Thursday into Unit 2 and white smoke was again observed through the blown-out panels. At Unit 3, which was the subject of helicopter water drops yesterday, water cannons have been spraying water on the spent fuel pond and seawater was injected into the reactor pressure vessel, he said. “An important safety concern remains the spent fuel pools at Units 3 and 4. Information is lacking on water levels and temperatures at the spent fuel pools,” said Andrew. Andrew said, “Another positive development is that diesel generators are providing power for cooling for both Units 5 and 6. No problems have been reported at the common spent fuel pool. The spent fuel in the pool is fully covered by water,” he said. For the second day, Japan’s Self-Defense Force units have aimed water at one of the Fukushima Daiichi reactors. On Friday afternoon, SDF units with the U.S. troops United States of used special fire engines to pump water in. Starting just after midnight Saturday local time, fire engines brought in by a special rescue unit of the Tokyo Fire Department sprayed tons of water at the plant’s Unit 3 reactor, where falling water levels have exposed the nuclear fuel rods. TEPCO’s office in Fukushima said that following the cooling efforts, radiation levels fell slightly northwest of the power plant. Efforts are being made to restore electrical power to the whole site. 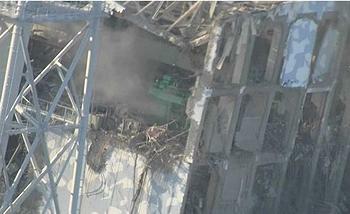 Power cables to the plant were snapped during the earthquake and the emergency diesel generators were submerged in the resulting tsunami. The Nuclear and Industrial Safety Agency said Friday that the installation of power cables at the Unit 1 and 2 reactors is expected to be complete on Saturday. The power cables at the Unit 3 and 4 reactors are likely to be installed on Sunday. 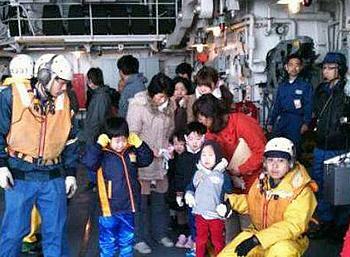 The agency said it will take time to confirm the safety of the damaged facilities. The nuclear safety agency has raised the severity level of the nuclear accident at Fukushima Daiichi to five from four on a seven-level international scale. This is the same level as the 1979 Three Mile Island accident in the United States. The highest level of seven has only been applied to the 1986 Chernobyl catastrophe. Given the damage to the nuclear fuel cores at reactors 1, 2, and 3 and the continuing radiation leak, the incident would stand at level five on the International Nuclear and Radiological Event Scale, an agency official told a news conference. Japanese police say they have so far confirmed 6,911 deaths in the magnitude 9.0 earthquake and massive tsunami that hit northeastern Japan one week ago. Police say 10,316 people remain missing. They suspect that many other people have not been reported as missing because entire families were swept away in the disaster, leaving no one to make reports.